I can feed two people without leftovers, and I can feed 6-8+ people with minimal leftovers. But ask me to feed 2-6 people and I’m flummoxed. It’s like I’ve completely forgotten how to scale for groups of less than six. Last night one person was off in Vancouver for the Olympics, one person was sitting at Logan airport attempting to fly to Virginia, one person had class and one person was running a book club, which meant we were down to a total of four people for Dinner and I spent 15 minutes trying to work out how much rice four people would eat. It’s no so much that recipes aren’t scalable. Most recipes scale up and down reasonably reliably. 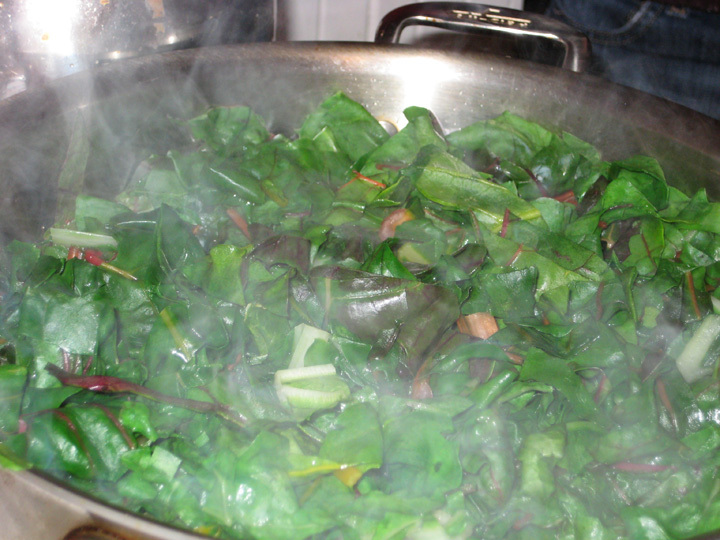 You might have to tweak for pot size or length of time that it’s going to take to cook because you have more volume, but by and large you can multiply or divide without too much margin of error. I am never more grateful for 5th grade math than when I’m cooking and I need to know what two-thirds of 2 ½ cups is and what the difference between that and three-quarters of 2 ½ cups is. All my recipes are covered in scribbles of fractions depending on whether I’m scaling a recipe up or down. The problem is that if you take a recipe for two people and multiply it by three it won’t actually feed six people. This isn’t because the recipe is faulty. It’s because six people will sit around a table and talk even after they’ve finished eating. They’ll go back for the crusty edges of the corn pudding, and a tiny little dab of mashed potato and some gravy from the stew, and really it seems silly to leave that half a scoop of rice just sitting in the bowl so someone should clearly finish it. They’ll sneak one more cauliflower floret and they’ll eat away at the left over green beans one sneak attack at a time, and all of a sudden where you thought you’d have leftovers there’s nothing left. This makes it sound like I’m complaining. I’m not. I hate having to store nine leftover green beans because I think cold green beans are revolting and usually they just end up sitting in my fridge in Tupperware until the next week when I throw them away. Plus, I’m honestly not as good about using up leftovers as I’d like to be. I always mean to eat them, but then I get hungry and making a sandwich or frying some eggs is so much faster than waiting for leftover stew to reheat. So I try to not have leftovers, or send them home with people who are more likely to eat them than I am. What I’m saying is that six people eat more than two people (x3) not because they’re hungrier but because they’re likely to be more social and therefore sit at the table longer. And this is what makes scaling recipes difficult, because there’s no magic formula that will tell you how much extra you have to make to budget for social tendencies, you have to kind of guess and base it on experience. This is why I find cooking for four more difficult than cooking for twelve. I cook for 6-8 all the time, and I’ve done 12-16 often enough that I can eye a recipe and guess, but I almost never cook for four and it never looks like it’ll be enough in the bowl and I’m paranoid that there won’t be enough to eat on the table and someone will go home hungry so I add a little extra, and then a little extra on top of that just be sure, and then I have mountains of leftovers. Although, that being said, I only had the one serving of stew leftover this week instead of the two I expected because we all sat around the table sneaking one more tiny spoonful as we talked, and there was no rice or greens left at all. Please don’t ask me to explain the name of this recipe, because I have no idea. I think it’s Bon Appetit trying to make a clever pun, but it’s either so terrible I’m not getting it, or so clever that the reference is beyond me. I promise this is a lot less daunting than it looks. I made it in an hour on Monday night. Place coriander seeds, fennel seeds, cumin seeds, black peppercorns, cloves, cardamom seeds, and cinnamon stick in small dry skillet. 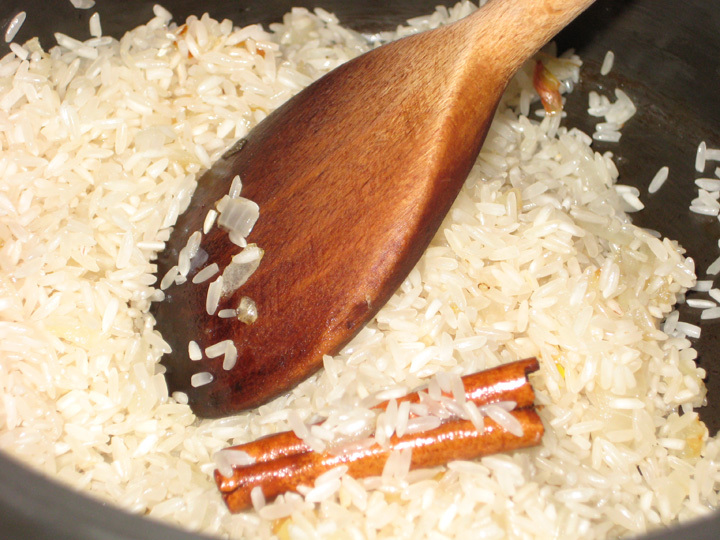 Stir over medium heat until fragrant and slightly darker in color, 5 to 6 minutes. Remove from heat; cool. Finely grind spices in spice mill or in mortar with pestle. Transfer to small bowl; add turmeric and cayenne. Heat 2-3 tsp oil in heavy large deep pot over medium-high heat. Add cauliflower florets; sprinkle with coarse kosher salt and sauté until beginning to soften and brown in spots, 6- 7 minutes. Transfer to medium bowl. Add 1 tsp oil and half of chicken to same pot; sprinkle with coarse kosher salt and sauté until chicken is light brown on all sides, about 6 minutes. Transfer chicken to large bowl. Repeat with remaining chicken, adding a little more oil if necessary. Add white parts of green onions, finely grated ginger, and minced garlic to same pot; reduce heat to medium and sauté until fragrant, about 1 minute. Add ground spice mixture; stir 15 seconds. Stir in chicken broth and bring to boil, scraping up any browned bits. Add crushed tomatoes; reduce heat to medium-low, cover, and simmer 15 minutes. 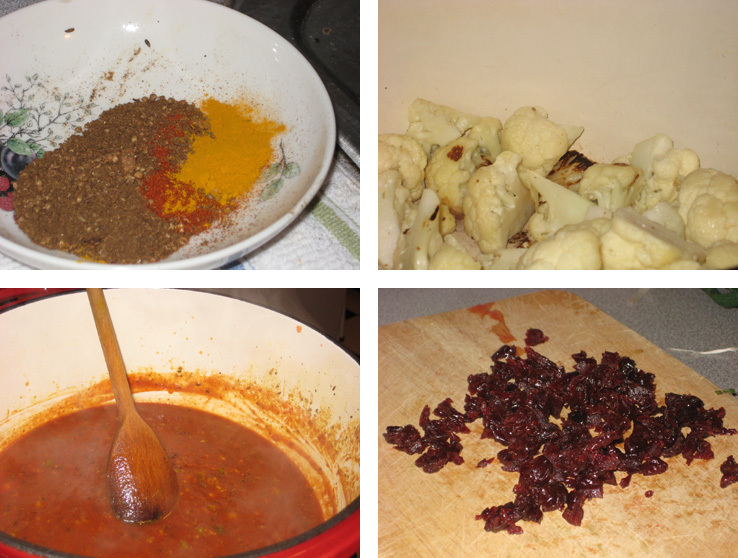 Stir in dried cherries and peanut butter; return chicken and any accumulated juices to pot. Cover and simmer 10 minutes. 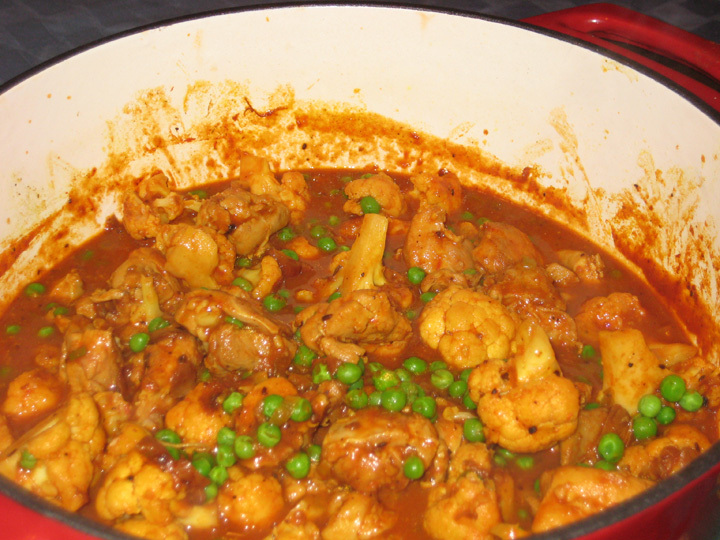 Add sautéed cauliflower to pot; cover and simmer until chicken is cooked through and cauliflower is tender. If the mixture seems to dry you can add some extra chicken stock in ¼ cup increments (recipes always say this, but this has never happened to me). Up to this point the stew can be made 1 day ahead. Cool slightly. Chill uncovered until cold, then cover and keep refrigerated. Rewarm over medium heat before continuing. Add frozen peas to stew and simmer until heated through, about 5 minutes. Ladle stew into bowls. 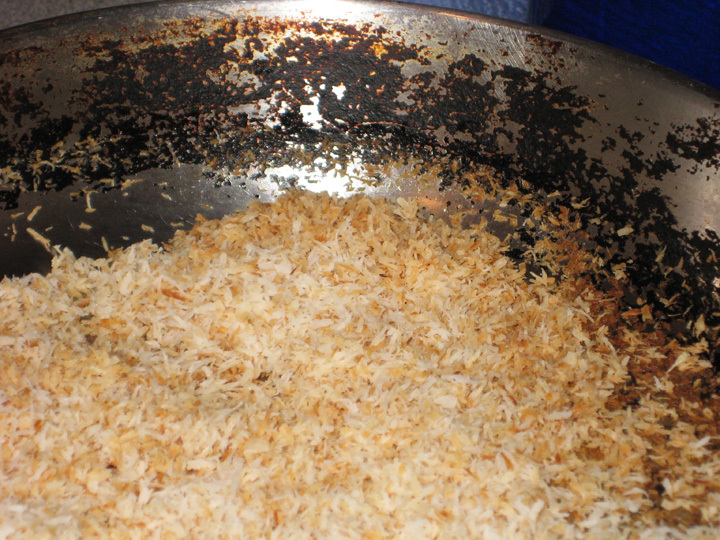 Serve with chopped tops of the green onions and some toasted coconut. Notes: I don’t have a spice grinder or a mortar & pestle so I used my cuisinart, which worked more or less. Really I need to buy myself a small spice grinder for the occasions when I need one. I barely cooked my cauliflower on Monday night, I threw it in when the chicken was cooked through and then turned off the heat because I figured it would be sitting in the liquid for two days and would then be reheated for the better part of an hour on Wednesday night and I didn’t want it to totally fall apart. I can never figure out what portion of dinner cauliflower should occupy. Is it a vegetable? It’s often served raw on vegetable trays which argues yes, but I always ate it smothered in cheese sauce as a child, which argues not so much. Is it a starch? See smothered in cheese as a side dish as the argument for, but it doesn’t taste like a starch even if it is usually white. This is a long way of saying I can never decide whether I also need to serve a starch when something includes cauliflower, but decided to here because it soaked up the (mildly) spicy sauce of the stew nicely. I am informed that cauliflower has more or less the same nutritional components as broccoli, which I’ll accept. But I still can’t quite convince myself that it fulfils the vegetable requirement of a meal.